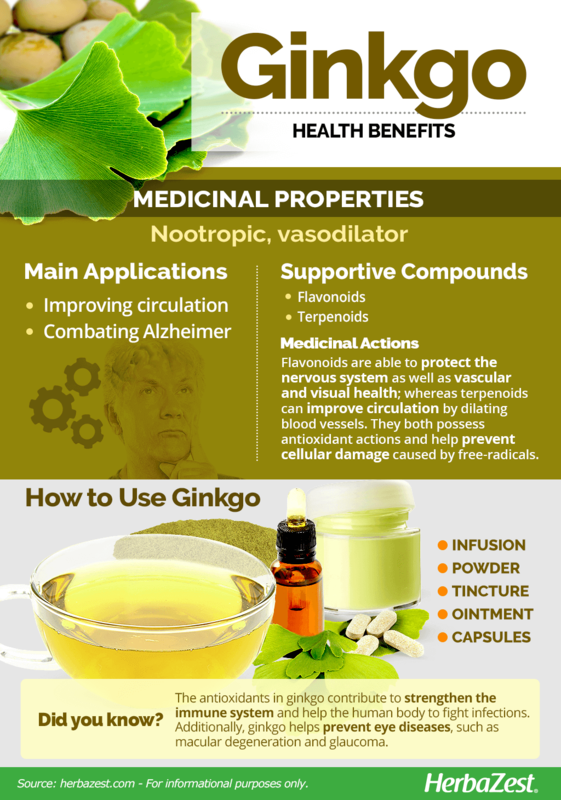 Ginkgo, which predates human civilization, has some extraordinary medicinal uses. Learn about its unique history and medicinal promise. Ginkgo – sometimes known as maidenhair tree - is a unique species in that it has been dated back around 270 million years, predating even the dinosaurs. It is often referred to as a “living fossil” for this reason, and ginkgo biloba is the only species to have survived the plants' genetic order. It originated in China, and has a secure position as a valued herb in traditional Chinese medicine. Its uses have become known across the world, and so it is now cultivated globally. Improving circulation. Compounds within ginkgo can dilate blood vessels, thereby enabling blood to flow more freely around the body. Combating dementia. Ginkgo has the potential to stave off dementia - as more blood reaches the brain. It is also thought that the compounds in the plant can be useful in protecting nerve cells which are damaged by Alzheimer's. The antioxidants in the plant can also be beneficial in combating this disease. Supporting the immune system. Ginkgo contains antioxidants which can help the human body to maintain efficient functionality, and resist infections. Preserving eye health. The plant is thought to protect the retina, thereby limiting the chances of developing eye diseases, such as macular degeneration and glaucoma. It has been claimed that ginkgo can treat various other ailments, such as vertigo, skin diseases, and respiratory complaints including asthma. There is currently no scientific evidence to support these theories, however new research is always being carried out to discover further abilities of many plants. Over 40 chemical components are known to exist in ginkgo. However, only two of these are regarded as medicinally advantageous. These are flavonoids and terpenoids, both of which have antioxidant activity. Antioxidants are hugely beneficial to the human body for a number of reasons. They act as a combatant to free radicals, which are harmful pollutants found in the body. Minimizing these internal pollutants enables the body to sustain an effective immune system, which guards against infections such as the common cold. Flavonoids are able to protect and support nerves, blood vessels, and retinas, and terpenoids can improve circulation by dilating blood vessels. The extensive scientific research that has been carried out so far has been inconclusive, and ginkgo's complex mechanisms of action are yet to be fully understood. Amaranth and blackberry offer protection against neurodegenerative diseases, while dong quai increases blood flow and camu camu promotes healthy vision. Ginkgo leaves are largely considered safe for consumption. However, there are possible side effects caused by excess consumption. These include headaches, stomach upsets, and skin irritations to those who have sensitive skin. Women who are pregnant or breastfeeding should seek advice from a health professional before regular intake of any herbal supplement. The fruit and seeds contain a substance called ginkgotxin which is poisonous and can cause vomiting, loss of consciousness and in extreme cases, death. If thoroughly cooked this toxin can be eliminated, but it is generally advised not to consume them at all. The medicinal properties are of a higher concentration in the leaves, so most supplements are derived from these rather than any other component of the plant. 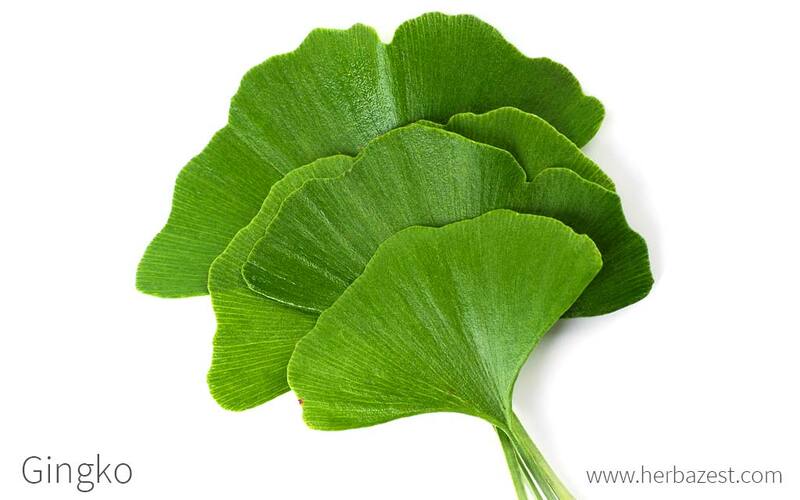 Due to the effect it can have on circulation, people who take blood thinning medicine should consult their physician before using any ginkgo preparations. Over consumption has been reported to cause bleeding in some people. Ginkgo is not one of the most well-known medicinal herbs, but its potential is acknowledged by herbalists, and so it is available to buy in the form of various health supplements. It is possible to consume the fresh, raw ginkgo leaves; however they are not generally easy to find. In China, ginkgo nuts are revered, and so often appear in recipes for food served on special occasions such as weddings and Chinese New Year. Infusion. Leaves can be stewed in hot water, and consumed for convenient intake of their medicinal properties. Powder. Ginkgo powder is made from dried and ground leaves. It should be mixed with water, juice, or milk to drink. The ratio should be as per the given instructions. Tincture. Available to buy or simple to make at home, tincture is another favored way to consume ginkgo, as it can be diluted according to an individual's taste. Ointment. This can be suitable for stimulating blood flow for those who have poor circulation. It can treat areas affected by pins and needles, or legs on those who suffer from Peripheral Artery Disease (PAD). Capsules. These are perhaps the most popular form of supplement, because they are a fast method of ingestion, and the concentration is constant. Ginkgo nuts can be found in some grocery stores, but specialized health stores and ethnic markets are known to carry fresher, more regular supplies. This is less of a concern in countries with high cultivation rates, though even in these areas it is more common to find the product during growing and harvesting seasons, in spring and early summer. Ginkgo remedies and supplements have grown in popularity exponentially in modern times, as research into the plant's medicinal properties becomes more widely known. Specialized health stores, online retailers, and even some supermarkets that carry herbal products can provide a wide variety of brands and concentrations. Ginkgo is a popular plant with gardeners of all skill levels due to its ability to tolerate a wide variety of soils and climate conditions as well as its hardiness and disease-resistant nature. A general understanding of its favored conditions is helpful when endeavoring to cultivate this plant. The tree is slow growing, adapted to many ecological conditions and shows numerous adaptation in developmental patterns. Ginkgo tree could be used as a street tree in conjunction with a secondary, faster growing street species. Ginkgo prefers deep, moist, sandy soil and requires full sun. In subtropical climates or in soils over wet or dry, the plant does not grow very well. It is somewhat sensitive to frost, but can tolerate temperatures as low as 5°F (-15°C). Carbon dating has revealed that Ginkgo biloba fossils date as far back as 270 million years, making ginkgo the oldest tree species still in existence. Ginkgo averages 66 - 115 feet (20 - 35 m) in height, and can spread up to 26 feet (8 m). The leaves are green to yellow, and are spread like a fan. After 20 to 35 years of growth, female trees will develop fruits - or seeds - which are yellow, fleshy, and spherical, resembling plums; when these fall and decay they exude a strong, rancid smell. A ginkgo tree can live for thousands of years, the oldest recorded being 3500 years old. Ginkgo (Ginkgo biloba) has a unique botanical background. It belongs to the family known as Ginkgoaceae, and it is the only remaining species within its family and genus. 11 species of ginkgo have been recorded in fossil history, although they are no longer in existence. These former versions of the plant were natively distributed throughout the world, though the fossil record indicates that they disappeared in North America roughly seven million years ago and later in Europe 2.5 million years ago. A combination of adaptive assets has allowed the sole surviving species to flourish. Ginkgo has a long history in China, and appears in religious and medical texts. Confucius (551 - 479 BC) was said to have taught while sat beneath a ginkgo tree, and Taoist philosopher Zhang Daoling is believed to have planted the tree on Mount Qingcheng, in circa 143 AD. This tree is still in existence, and remains an important shrine to the “Heavenly Teacher”. Ginkgo trees did not appear in Europe until 1727, when Dutch traders brought it back from Japan. They were spread across the continent, and in 1754 were planted in England's Kew Gardens where they still stand today. Harvesting ginkgo seeds, for both culinary and pharmaceutical purposes, forms an industry that provides the sole means of livelihood in China for thousands of families, who are in charge of about 90% of the plant's global production. Approximately $65 million USD was generated from exports in the country in 2011 alone. It was estimated; however, that commercial cultivation of the product was highest in France and Germany in the same year. As the tree ages, stalactites can develop on the trunk, which many people believe resemble the appearance of breasts. In Sendai, Japan, there is a ginkgo tree which is said to stand upon the grave of a wet nurse who was employed by an emperor. It is believed that she pledged to Buddha that she would provide milk to all babies who could not receive any from their mothers. This myth has led to many woman visiting the site, to pray that they can nurse their children. Gardening. Throughout the world, ginkgo is widely cultivated as an ornamental plant. It is also a frequent choice in city planning for adding green to urban areas across the globe. Carpentry. The wood of the ginkgo tree is often favored for using to make furniture, due to its strength, good color and the fact that it polishes well. Ginkgo is an interesting and unique species, which offers considerable health benefits. Scientific research is presumed to continue for the foreseeable future, which will likely reveal further medicinal properties and consequently more conditions that the plant could potentially treat.